The World of Miss Mindy statue spotlights Grumpy! Inspired by Snow White and the Seven Dwarfs. Heigh Ho, Heigh Ho, its homeward bound he goes! Bring home Grumpy with this colorful piece inspired by the classic Walt Disney movie Snow White and the Seven Dwarfs. This whimsical statue is designed by cartoon folk artist Miss Mindy! 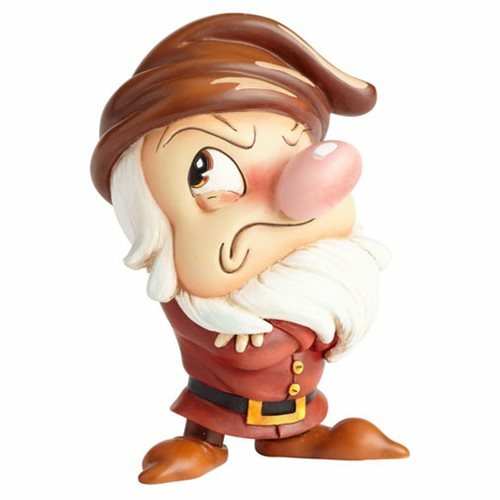 The beautiful Disney The World of Miss Mindy Snow White and the Seven Dwarfs Grumpy Statue is made of stone resin. Measures about 4 1/2-inhces tall x 3 1/4-inches long x 3-inches wide.